Google Earth is a virtual globe program that maps the earth by the superimposition of images obtained from satellite imagery, aerial photography and GIS 3D globe. The viewer is available for free download at Google Earth. The product is designed for use on newer computers with broadband or higher levels of connection. Once you have downloaded Google Earth, you can click on this updated June 29, 2012 beach access map link and zoom-in to the shoreline area in which you are interested to see the current access status. The color-coded "access line" indicates the status of shoreline access at the time the map was updated and is based on recent GPS coordinates of the actual shoreline. The underlying Google Earth photo image is dated and may not accurately reflect the current location of the shoreline. Closure conditions may change in the field on short notice. On-site signage, rather than the Google Earth map, is the most accurate and current indication of what is open or closed to the public. Closed areas are clearly marked in the field with closure signs or "symbolic fencing" consisting of posts, closure signs, string and flagging tape. Knowledge of tidal changes and caution should be exercised while traveling the beaches of the park. Please Note: As you close Google Earth, the program will ask you if you wish to save these items in My Places. To ensure that you continue to view the most current beach access map, select "Discard". References to non-U.S. Department of the Interior (DOI) products do not constitute an endorsement by the DOI. By viewing the Google Maps API on this web site the user agrees to these Terms of Service set forth by Google. Beach Fire Permits are required starting May 1, 2012. Beach Fire Permits are free. 1. Click here to download this Beach Fire Permit pdf file. 3. Sign and date the permit. 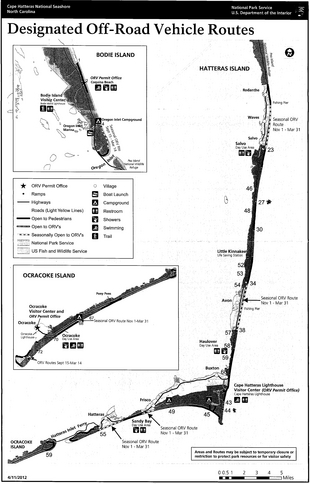 o Ocracoke Day Use area. · From November 16 - April 30, beach fires are allowed on throughout the park. · Fires are allowed from 6 am to 10 pm. · The Beach Fire Permit is valid only when a responsible adult (18 years of age or older) is present. · Fires, no greater than 3 feet in diameter, may be ignited and maintained seaward of the ocean dune, below the high tide mark and at least 50 feet from any vegetation. · Fires cannot be left unattended and must be completely extinguished (cold to touch) upon termination of use. 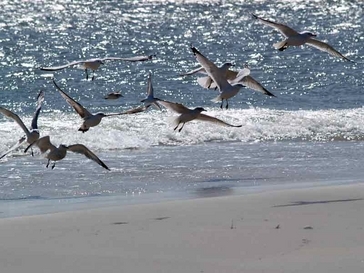 · Clean area of all trash before leaving the beach and remember the "pack in/pack out" practice of leaving national seashore beaches in a clean and safe condition for the next visitor. If you have trouble downloading or printing the Beach Fire Permit you can get a permit in person by visiting any seashore ORV permit office, campground, or visitor center. 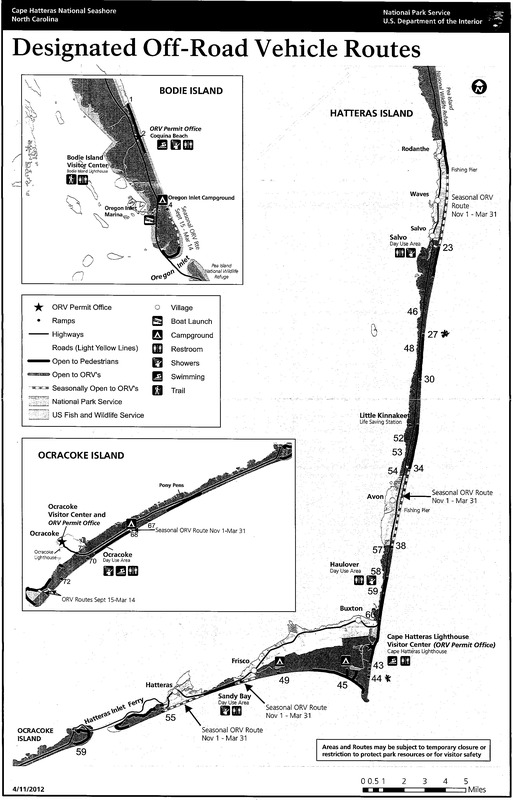 · Ocracoke Island by the NPS visitor Center (40 Irvin Garrish Highway, Ocracoke, NC). Seashore Campgrounds include the Oregon Inlet Campground, Cape Point Campground, Frisco Campground, and Ocracoke Campground. Seashore Visitor Centers include: the Bodie Island Visitor Center, Hatteras Island Visitor Center, and Ocracoke Island Visitor Center. One of the unique features of the Outer Banks is having access to drive out on the beach to find that perfect wave, fishing hole, stretch of beach for shelling or solitude, etc… The new proposed law that’s ready to go in effect February 15, 2012 suggests some of the key areas to be permanently closed or to have limited access. After 5 years of continued meetings, public forums, public comment periods & 2 years of being a member of the Negotiated Rule Making Committee,The North Carolina Beach Buggy Association has had enough and are ready to fight to regain access that was rightfully granted for recreational use. The Cape Hatteras Access Preservation Alliance (CHAPA) filed a legal suit against the DOI, NPS, and CHNSRA asking the court to declare that the NPS acted improperly and illegally and to provide permanent injunctive relieve to prevent NPS from implementing the plan. Jim Keene, past President of the North Carolina Beach Buggy Association, talks about the new restrictions and regulations for Off-Road Vehicle (ORV) driving in Hatteras. He asks the question; has the National Park Service forgotten what recreation means?